The aforementioned governor’s race is getting all the attention, but Virginia’s entire, 100-seat House of Delegates is up for reelection, too — and those down-ballot races may serve as the best predictor of what’s to come in 2018. Republicans hold a commanding 66–34 advantage in the House, and they’re unlikely to be driven from power there. But they’re on the back foot this year, with 17 Republicans defending seats in districts where Hillary Clinton beat President Trump in 2016, many in relatively liberal northern Virginia. Such races have drawn a surge of interest from out-of-state Democratic groups and backers eager to refocus the party’s attention on winning at the state level, an art Republicans have mastered. Democrats are expected to pick up a few seats, but the precise number will be closely watched by political observers. As Cook Report’s Dave Wasserman writes, “If Democrats pick up five seats or less, Republicans would breathe a sigh of relief. If Democrats pick up five to ten seats, it would suggest Democrats are in contention” to win back the U.S. House next year. Of course, the races matter to Virginians, too: They could determine whether the state finally expands Medicaid, which would bring health care to 400,000 people. Maine is the only state in the Northeast that chose not to expand Medicaid under the Affordable Care Act, depriving about 70,000 Mainers of subsidized health care. 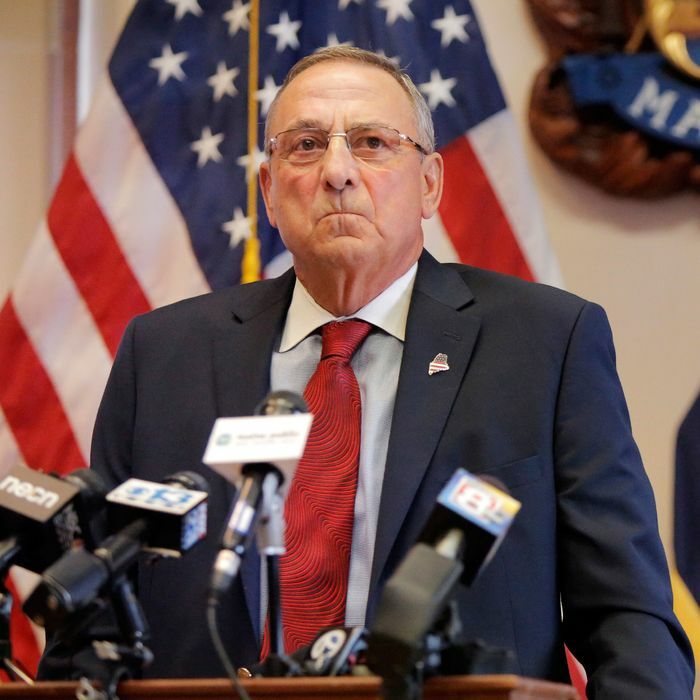 The blame for this missed opportunity can be laid squarely at the feet of the state’s proto-Trumpist Republican governor Paul LePage, a stalwart critic of government spending and President Obama. The Maine legislature has passed Medicaid expansion several times, only to have the bills vetoed by LePage. So Mainers have brought it to a referendum on Tuesday. If passed, the law would require the state to expand the program to include adults under 65 with incomes at or below 138 percent of the federal poverty line. Opponents have raised concerns about the expansion’s cost to the state, small businesses, and local hospitals, but Medicaid has been a sound financial deal for the states that have expanded it. And it’s among the the most popular federal programs in the country, which is one reason repealing the Affordable Care Act has been so difficult. If Maine becomes the first state to expand Medicaid through a popular vote — and the 32nd state overall — it will be a sign that similar efforts in other Republican-controlled states might succeed, too. For the most part, elections in the Empire State are quite sleepy this year; in the highest-profile contest, New York City residents are likely to give Mayor Bill de Blasio a second term by an overwhelming margin. But there is at last one noteworthy proposal on the ballot: the chance to hold an exceedingly rare state constitutional convention, or “con con” in popular parlance. Public opinion has cleaved along unpredictable lines. Many New Yorkers would like to reform the state’s infamously sclerotic and corrupt government by mandating new ethics guidelines and other reforms. But powerful interest groups, from labor unions to Planned Parenthood, oppose the measure, fearing that the convention could become a dangerous free-for-all that ends in the rollback of long-standing protections. This week, the New York Times came out against the convention, reasoning that “the possibility of its accomplishing nothing at significant cost, or, worse, setting New York back even further, is worrisomely high.” Most voters seem to agree with that assessment; polls show a wide majority plan to reject the proposal. A single special election in a Seattle suburb is the key to total control of state government for Democrats in Washington State. If Democrat Manka Dhingra defeats Republican Jinyoung Lee Englund in a race brought on by the death of a Republican incumbent, the state would become just the seventh in which Democrats control both the governorship and the state legislature. (Twenty-six states are completely controlled by Republicans.) Dhingra has led in polls of the blue-leaning district, as Englund tries to distance herself from President Trump. A Dhingra victory would mean that Washington is more likely to move on a raft of progressive legislation involving guns, climate change, voting rights, and more. It would also create a West Coast axis of Democratic government control, possibly leading to a coordinated carbon-tax initiative between California, Oregon, and Washington. With so much at stake, a cascade of outside money has been pouring in, to the tune of more than $8.5 million.